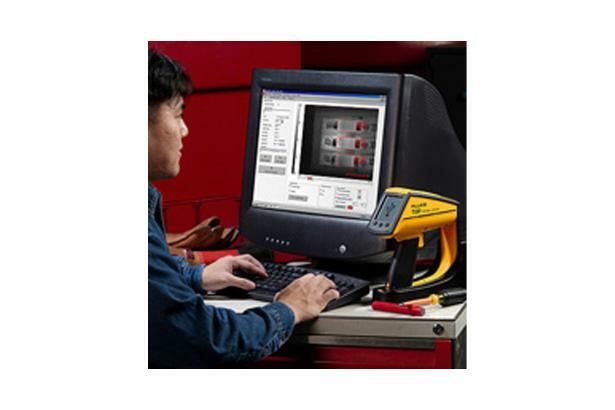 Fluke InsideIR software is included with each Fluke thermal imager. This powerful software package allows the user to store and analyze thermal images and associated data, create inspection routes, adjust key measurement parameters, and report findings. Thermal images taken in the field are easily uploaded and stored into the InsideIR software. An image gallery (see figure 1) gives a quick overview of the measurements taken in a given session. All images are date and time stamped, contain location information, and are stored with associated data such as temperatures for every pixel in the thermal scene and imager settings for that location. Just double-click an image to perform a detailed analysis (Figure 2a and 2b). See temperature readings at any point in the scene, or select an area of interest. The maximum, average and minimum temperature of the selected area is displayed. Figure 2a: Stored image using rainbow palette with temperature range set from 3 to 19.2º C. Temperatures for individual points and for larger areas are displayed. Fluke thermal images are fully radiometric, and a temperature table containing temperature readings for every pixel in the scene (see figure 3) can be downloaded and imported to popular spreadsheet programs like Microsoft Excel. Figure 3: Table containing the thousands of individual temperature readings that can be uploaded to popular spread programs. Predictive maintenance programs rely on periodic inspections of critical plant equipment. The InsideIR software allows the development of a regular program by defining the route of equipment to be inspected (see figure 4). By assigning unique location names, inspection notes and key infrared parameters, a routing sequence can be defined and uploaded to the thermal imager. On-camera instructions prompt the user to the exact location where to take images. New images and associated location data are easily compared to previous scans, helping to identify potential problems before they cause failure. Figure 4: Creating an inspection is easy through location name and number. A field for comments allows for detailed instruction to the operator. With the click of a mouse, a professional thermographic report will be created (see figure 5). The user can insert a description of the problem and the action to be taken. The report includes the thermal image, as well as a place for a digital photograph, if available.